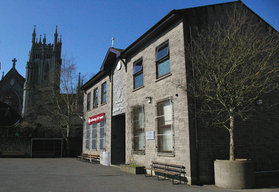 While the premises of CBS Kilkenny is not a new building, it has been very well maintained and upgraded in recent years. In August 2016, the new extension was opened. This includes a new Bialann (Dining Area), Offices, Classrooms, Computer Room and an extended Technology Room. During Summer 2012, the school was fully fitted with the leading edge Meraki cloud based wireless system, which has expanded device capacity well into the future. In August 2012 the newly developed sports field was put to good use for the first time. In 2011 the school was fitted with a state of the art Fire Alarm and zoning system. All classrooms have data projectors, PCs, high speed internet access, and several teachers use tablets as teaching tools.